I'm not crying, you're “Crosbying”! Christmas is a wonderful time of the year for many, but it does not mean there isn't some tough struggles out there for some people. While our prayers and positive thoughts go out to them, Edmonton Oilers captain Connor McDavid wanted to make them public after he was informed that a young Leukemia patient received his jersey for Christmas, as reported by Bardown. 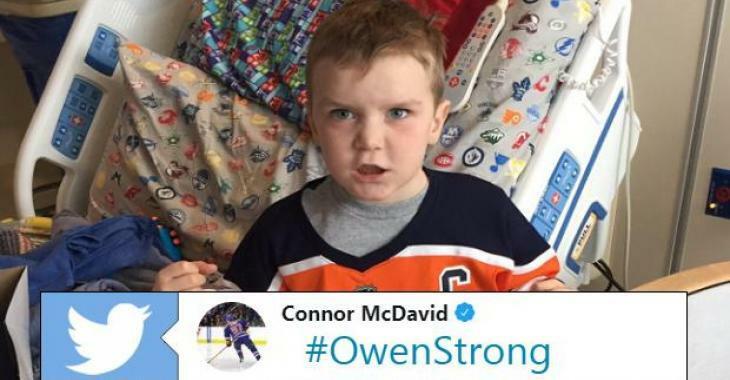 Four-year-old Buffalo resident Owen, who’s currently battling Leukemia, is a huge Oilers fan and received the beautiful orange Connor McDavid jersey as his family celebrated Christmas in his hospital room. Standing next to his NHL sheets on his hospital bed, Owen showed off his new jersey in a picture that quickly became viral on Twitter. McDavid himself took to social media to wish the youngster a Merry Christmas and encouraged him to stay strong with an emotional tweet. Even the Oilers were inspired by their captain and took to social media to wish Owen a Merry Christmas. The Sabres will travel to Edmonton on January 14th and we are pretty sure Owen will be cheering his favourite team, sporting his new jersey!